Whether you are in the field of publishing or in the photography business, there will come a time when you need to deliver your end product to the clients/customers by shipping. Although postal envelopes could work for most paper documents, some other shipped items need special attention in the packaging to protect them from punctures and moisture. This is when the padded mailing bags come in handy. The obvious feature that padded mailing bags offer is to protect contents. However, we have different types of padded mailing bags designed for different types of items. For example, bubble-lined poly mailers have bubble cushioning inside which is perfect to contain CD or DVD and protect them from puncture. The poly mailers have clear front, allowing a nice display of the inside content. They’re absolutely great to send catalogs or monthly magazines that your clients subscribe. The kraft dunnage bags can be air-expanded up to 18” wide, giving the content nice, intact placement when shipping is expected to be a little rough. These bags are perfect for international shipping by air, ship, train, etc. 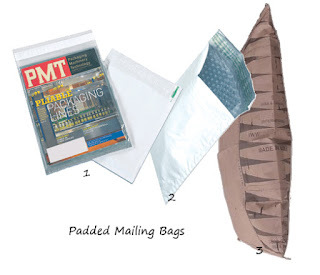 There are also padded mailers with or without self-seal for your general shipping use. Browse our rich options of padded mailing bags here and ensure the safe deliveries of your products to the customers for possible repeat transactions.